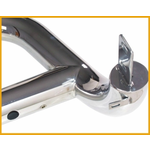 3" or 4" Bull Bar with durable skid plate adds the bullness protection to your vehicle from front to back. Available for most of today's trucks and SUVs, also adds a unique look to your vehicle. 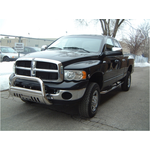 Each bull bar is custom designed for your veihicle, to offer you a no drill installation. 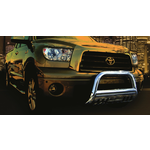 Both the bull bar and skid plate provide extra front end protection to your vehicle. 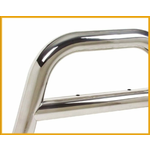 It is made of 3" / 4" diameter heavy duty stainless steel tubing, and hand polished to mirror finish. Pre-Drilled holes for optional auxiliary lights. 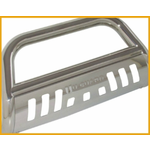 Skid plate provides additional protection for your vehicle. 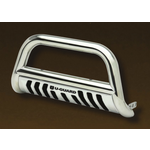 All brackets welded on bull bars are made of 304 stainless steel to offer a complete look to the product.